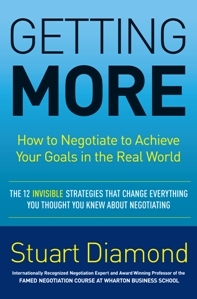 A few weeks ago I finished listening to Stuart Diamond’s Getting More: How to Negotiate to Achieve Your Goals in the Real World. It had lots of great ideas to help one not only negotiate, but generally do well in the area of human relations. Define goals (short and/or long term). What are the problems in reaching the goals. Who are the parties? Are their 3rd parties? What if no deal? What is the worst case? Take time to prepare. Who has more information? What are the pictures in the heads of each party? What are their cultures and conflicts? Is there trust? Try role reversals. What is the style of communication? What is the nature of the relationship? What are the standards? Their standards? Exterior/normal standards? Re-examine goals to see if they are still realistic. Brainstorm options to meet goals/needs. What can be traded or linked? Take steps to reduce risk. Who are common enemies? Common influencers? Can they be useful? Can the situation be framed differently? Create a vision, develop questions. What alternatives exist to improve or affect the deal? What are the best options? Dealbreakers? Who presents: How and to whom? What is the process? Agenda, deadline, and time management. What are the commitments/incentives for the other party?